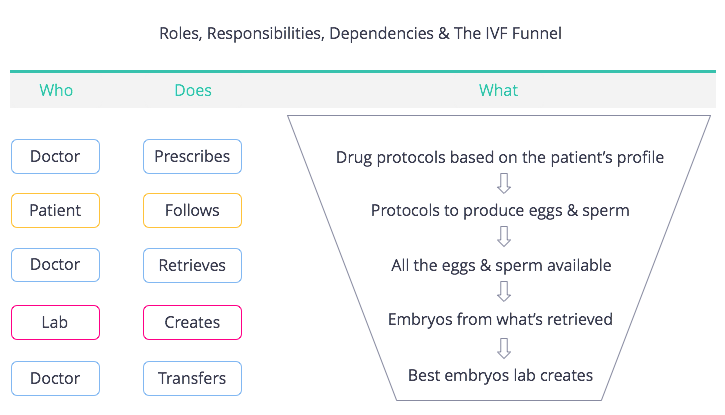 FertilityIQ: What Is A Fertility Laboratory? Once the patient and doctor have produced eggs and sperm it is the laboratory’s job to create and grow healthy embryos. Thereafter, the doctor transfers those embryos into the woman’s uterus. The clinic and doctor are interdependent. If the doctor’s protocol is unable to produce enough healthy eggs and sperm, or the laboratory enough healthy embryos, the cycle will end in failure. 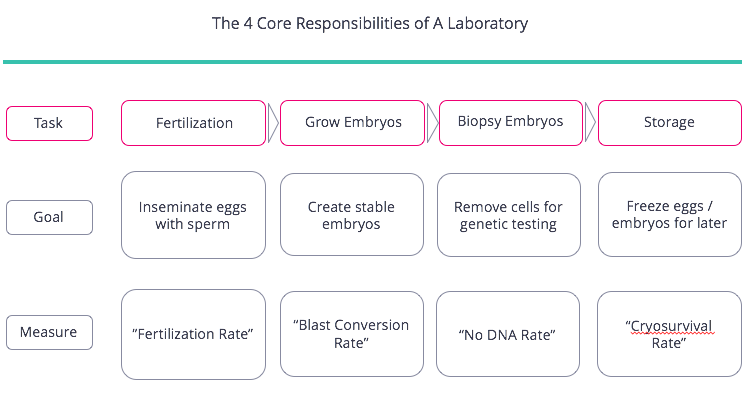 In our minds, the laboratory has four key, discrete tasks to provide the doctor with healthy embryos to transfer. The laboratory needs to fertilize as many eggs as possible, cultivate the resulting embryos to a healthy state, be able to biopsy the healthiest embryos for genetic testing (if requested) and then freeze/thaw either eggs or embryos for future use. Each step is crucial, and there is often no agreed-upon ‘best practice’ to execute any step, but thankfully each discrete task can be measured and laboratories can be compared (which we'll cover in the next chapter). We think of laboratories as elaborate kitchens: they are given ingredients (sperm and eggs) and must deliver a satisfying meal (healthy embryos). Like in the kitchen, the laboratory has chefs (embryologists), recipes (processes), pots & pans (culture media) and ovens (incubators). When one facet breaks down, results suffer. Comparing laboratories can be challenging because their results may partially reflect the mix of patients being treated at that clinic and the choices doctors make (e.g hormone protocols) to retrieve enough good quality sperm and eggs. All the same, when we compare laboratories based on similar patients (e.g. egg donors), we notice that some clinics are more likely to develop embryos projected to succeed. In the study below, you will note that even with donor eggs some clinics developed far more embryos that were euploid (chromosomally normal) and thus more likely to lead to a live birth. Embryologists themselves believe there is a vast distance in outcomes between “passable” (minimally-acceptable) and “benchmark” (excellent) laboratories. According to a panel of 20 embryologists, embryos from a “passable” lab should implant in the woman’s uterus only 30% of the time. “Benchmark” laboratories should have rates twice as high. Better embryos translate into better implantation rates, which often (but not always) translates into higher live birth rates. Below you can see the live birth rates at two clinics located 10 miles apart on the east coast, for similar patients (egg donor recipients). The differences in outcomes are substantial and have endured for the past few years. Finally, three observations about laboratory quality. First, laboratory best-practices are hard to replicate in different locations, and we have yet to see any data that suggests laboratories owned by the same company have comparable abilities and results. Look at each laboratory on its own merits and track record. Second, some laboratories may excel with certain types of patients. If you are repeatedly running into issues with your current clinic’s laboratories, it may make sense to look for a clinic with a laboratory that takes a very different approach. Success rates looking solely at their fresh cycles (removes the PGS confounder) with donor eggs. Donor eggs are theoretically comparable across clinics.